Having grown up around cystic fibrosis, I learned a great deal about day-to-day struggles those with cystic fibrosis face. Back then, researchers were just beginning to learn about cystic fibrosis, developing therapies and improving treatments. In fact, the cystic fibrosis gene wasn't discovered until 1989. My brother was born with cystic fibrosis in 1965 and he wasn't diagnosed with cystic fibrosis (CF) for years after birth, simply because not much was known too well known about the disease at that time. Even worse, health insurance almost never covered cystic fibrosis treatments or therapies. But, a lot has changed, evolved and improved with cystic fibrosis since then and I attribute some of that change to awareness. The more informed and aware we are of the disease(s) that affect our lives, whether directly or indirectly, the greater the exponential benefit will be. The month of May is designated as Sixty Five Roses, Cystic Fibrosis Awareness Month. With the color purple being nationally recognized as the Cystic Fibrosis Awareness ribbon color. Raise Awareness Beautifully with my line of Crystal Awareness Jewelry created with the direct purpose of starting that conversation....and helping to raise awareness of cystic fibrosis. Handmade beaded awareness bracelet features purple amethyst Swarovski Crystals with white Swarovski Pearls accenting sterling silver awareness ribbons beads. 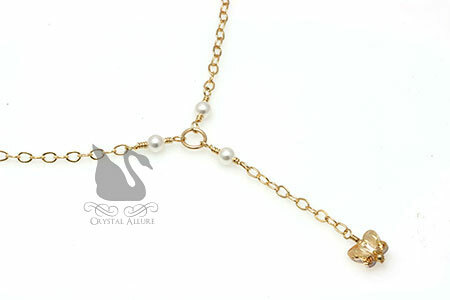 Finished with a delicate pearl and crystal dangle charm and signature jewelry tag. Measures 7-1/2". 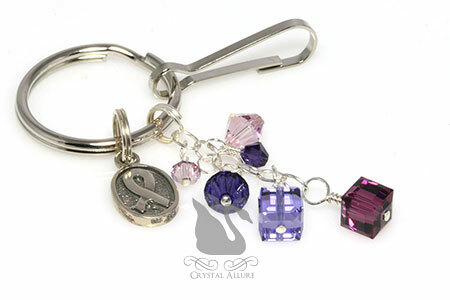 A charming handmade beaded keychain that raises awareness of Cystic Fibrosis. Use as a key chain or a purse charm! Design features a cascade of purple Swarovski Crystals on a sterling silver chain, accented with a two-sided awareness ribbon oval charm bead, silver hook and 25mm key ring. Easily attach this design to your purse, handbag or your keys. Total length measures 2-1/4". Not all bracelets are the same. For example, a size 7-1/2" bracelet with a traditional lobster clasp will typically measure as a 7-1/2" from end to end. However, a bracelet designed with a toggle clasp may measure at an 8" but fit comfortably a 7-1/2" wrist. This also holds true for bracelets designed with larger beads and gemstones. These bracelets should be purchased at a 1/4"-1/2" larger than needed size so that it fits comfortably on your wrist. To help assist you, use this Bracelet Sizing Standards Guide to properly size your handmade beaded jewelry bracelets from Crystal Allure Beaded Jewelry. All Crystal Allure Beaded Jewelry handmade bracelets are measured from end to end including the clasp and some designs are available with an extender chain to allow for adjusting the length. To ensure that your bracelet will fit you when it arrives, use this guide and/or sizing chart below and keep in mind (from above): The chunkier the beads, the smaller the fit (i.e., an 8" chunky bracelet, which might be a lampwork bead bracelet, will fit more like a 7-1/2"). 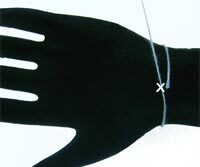 To determine the bracelet or watch size you need, measure your wrist with a soft flexible measuring tape -just below the wrist bone (see illustration below). If you do not have a measuring tape you can use a ribbon or piece of string. Mark the length then measure with a ruler. This measurement gives you your actual wrist measurement. To allow for movement and flexibility, bracelets with a toggle clasp should be ordered larger and you should add 1" to 1-1/4" to your actual wrist measurement (from Step 1 above). For bracelets with a lobster clasp, add 3/4"-1" to your actual wrist measurement. Jewelry makes a wonderful gift, but sometimes it's difficult to guess your gift recipient's wrist size. If the bracelet is a gift and you don't know their wrist size, refer to the bracelet size chart below and estimate. The average person is generally 7.25-7.5". Extra Large: 8-8.5 inches and up. If you are still not sure, buy a small or medium bracelet with an extender chain. A bracelet extender not only adds versatility to the length, but it's also a nice decorative touch. 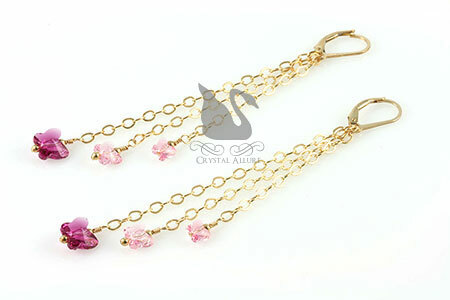 At Crystal Allure Beaded Jewelry, I try to offer an extender chain on most bracelets that will accommodate one. Our extender chain adds anywhere from 1" to 2.5" to the length of the bracelet. This guarantees your bracelet will fit. Feel free to refer to this jewelry article when you are buying from any online jewelry designer. And remember that when you buy from a handmade jewelry designer, you have more control over the specifics of your jewelry (size, color, etc). 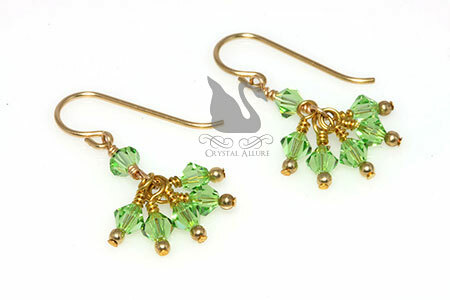 When you shop at Crystal Allure Beaded Jewelry, I want you to be happy with your purchase. 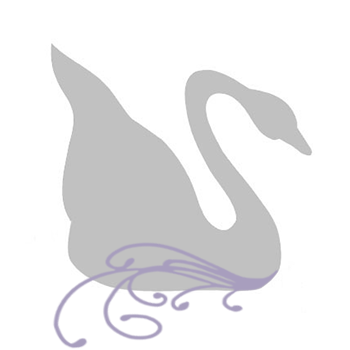 You can feel comfortable emailing me prior to placing an order with any questions you might have. Please refer to the custom jewelry policy when considering what size to order for a custom design or for a bracelet you may be gifting. 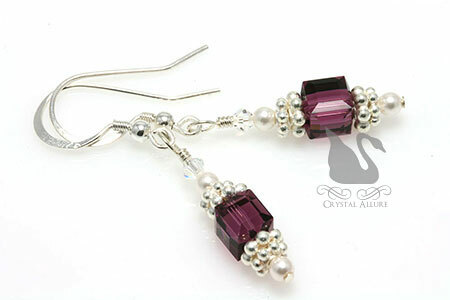 Please note: Due to bead size variations most Crystal Allure Beaded Jewelry have an ~1/8" tolerance in sizing. Also, if the beads, pearls, gemstones or other adornments are very large, the room for your wrist may decrease. May is designated as National Cystic Fibrosis Awareness Month and did you know that young children call cystic fibrosis, "Sixty Five Roses". The color purple is nationally recognized as the Cystic Fibrosis Awareness ribbon color. 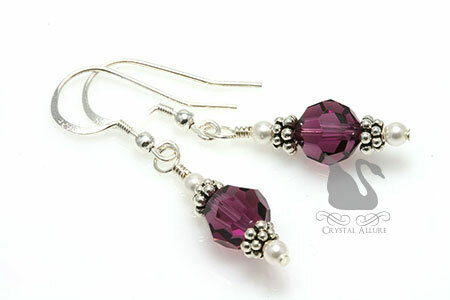 This lovely pair of handmade beaded earrings were designed to raise awareness of Cystic Fibrosis and showcases beautiful purple amethyst Swarovski Austrian Crystals flanked by .925 sterling silver Bali and white Swarovski Pearls. Length is 1" from bottom of ear wire. This lovely pair of handmade beaded earrings designed to raise awareness of Cystic Fibrosis showcases beautiful purple cube amethyst Swarovski Austrian Crystals flanked by bright .925 sterling silver Bali, white Swarovski Pearls and clear Swarovski Crystals. Length is 1" from bottom of ear wire. 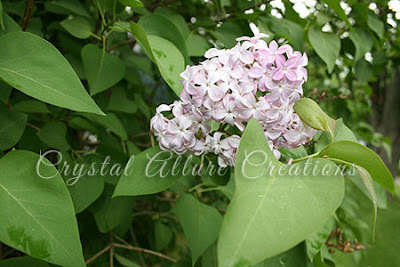 In Upstate New York, this is the last weekend of the annual Rochester Lilac Festival. This event is scheduled during May when the numerous flowering lilac bushes are typically (or hopefully!) in full bloom. It truly is a sight to see and smell! With fragrant blooms and a variety of colors from pink to purple, these lovely lilacs are what inspired this lilac purple handmade jewelry set. When I came across these gorgeous amethyst gemstone nuggets, I just couldn't put them down. They felt so good in my hands and I knew they would make a beautiful necklace with the unique gold clasp. Just like the beauty of springtime lilacs in May, amethyst gemstones are soothing to the eye and have long been admired for their rich, beautiful purple color. 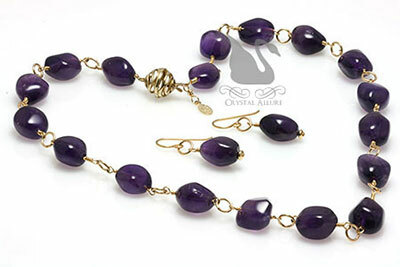 Amethysts are elegant, graceful and when paired with gold are truly a sight to behold. This handmade necklace is designed with purple lilac amethyst gemstone nuggets and each one has been wire wrapped to a 14kt gold fill ring. The unique feature of this gemstone necklace is the open-weave gold vermeil box clasp that can be worn in the front for a clever and stylish alternative to the traditional clasp behind the neck. Either way you wear it, it is your style, your way. Necklace is a Princess length of 18". The handmade gemstone earrings feature a pair of rich purple lilac amethyst gemstone nuggets, 14kt gold fill ring circles, beads and gold fill french hook earwires. The length is 1" from the bottom of the earwire. If you wish to purchase these items separately, please feel free to contact me for pricing and checkout options. The Peridot, Augusts' Birthstone, forms deep inside the Earth and is brought to the surface by volcanoes, in Hawaii. It is believed to symbolize the tears of Pele, the goddess of fire and volcanoes. Peridot, when set in gold metal (the metal of the Sun), is said to bring the wearer power, influence and a wonderful year. This gemstone is also said to protect the wearer against nightmares. But, what I found most interesting about the Peridot gemstone is that it is believed to heal the lungs. It was thought, if the gem was crushed into a fine powder and administered to a person suffering from asthma, it would cure them of their ailment. It just so happens that May is National Asthma and Allergy Awareness Month. The Peridot Birthstone was once only mined at night because the soft, lime green color glowed under a starlit sky, like a lantern. For that reason, it has been dubbed the title of "The Evening Emerald". When set in sterling silver or platinum jewelry this luminous green color birthstone gem, from Mother Nature, truly shines. The gorgeous green peridot gem makes the perfect 16th Anniversary gift because it is associated with love, loyalty, commitment and harmony. Sparkling Peridot gemstones have been worn for centuries and adorned in handmade jewelry necklaces, bracelets and earrings. Here, at Crystal Allure, Peridot birthstone beaded jewelry can be customized with natural Peridot gemstones or the more budget friendly alternative, Swarovski Crystals (my personal favorite!). If you are concerned about wearing earrings that are too heavy, these little beauties are the perfect solution! These petite handmade beaded earrings are super light-weight and perfect for everyday wear. A cluster of five shimmering peridot Swarovski Crystals have been individually wire wrapped, accented with 14kt gold fill beads and hang from a single wire wrapped green peridot crystal. 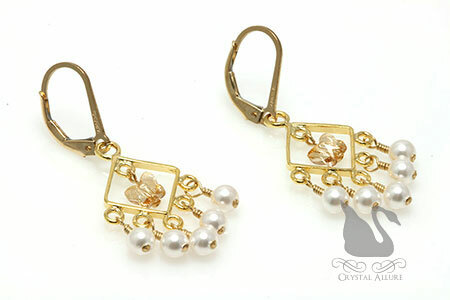 Earrings are finished with 14kt gold fill french hook ear wires and measure 3/4" from the bottom of the ear wire. 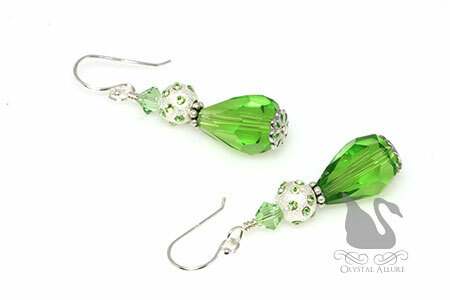 These sparkling handmade beaded earrings are designed with peridot Swarovski Crystals, peridot crystal accented sterling silver stardust Pave' style beads, sterling silver Bali, green glass teardrop beads and silver filigree bead caps on sterling silver hooks. The length is 1-1/4" from the bottom of the ear wire. We are already into May and work has begun on Courtney's own Senior Ball custom prom jewelry in a lovely aqua blue. 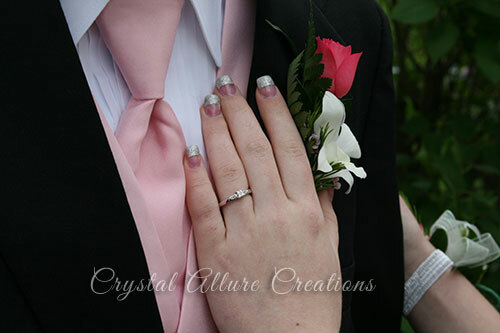 But, first before I want to share with you her final prom jewelry for his Senior Ball, from last year. 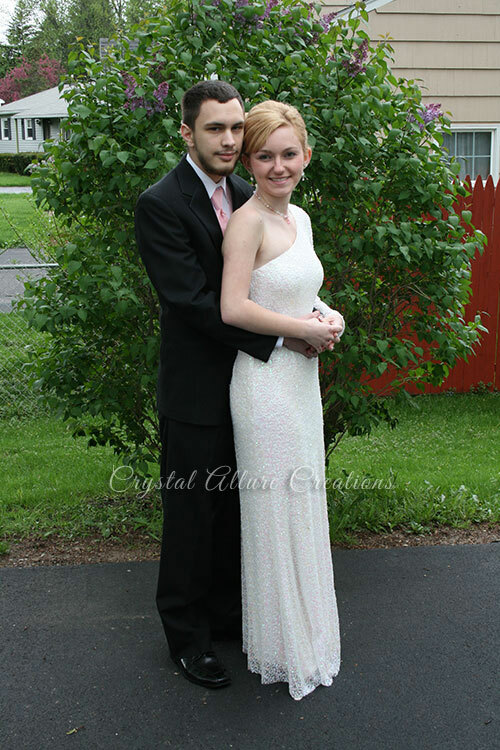 If you recall, Courtney was attending her boyfriends' Senior Ball and I detailed the design process that included a white dress with sequins and crystal prom jewelry in both aurora borealis and pink crystals. This custom prom jewelry set turned out beautifully! Designed using aurora borealis (AB), pink and pink aurora borealis Swarovski Crystals individually wire-wrapped into a necklace with a delicate pink crystal drop pendant. Coordinating crystal drop earrings and matching crystal encrusted hair combs finish this sparkling jewelry set. 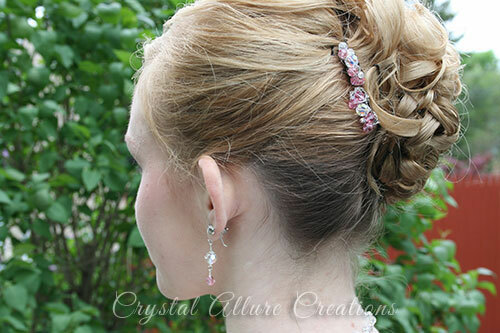 This next picture shows the beautiful crystal encrusted hair combs that I designed for her updo. It's the first time I've done hair combs and I think they turned out perfect. Yes -he proposed! A perfect Prom proposal. The proposal Courtney received was actually a pre-engagement proposal. But, all the same, it was my first handmade jewelry prom proposal! What a happy moment for a memorable event in their young lives. Courtney rockin' her pre-engagement diamond ring! In this final picture, Courtney is rockin' her pre-engagement diamond ring. This proposal definitely made it a memorable day! I was honored to have been chosen to create this custom crystal jewelry for Courtney and to have been part of this special day with her. 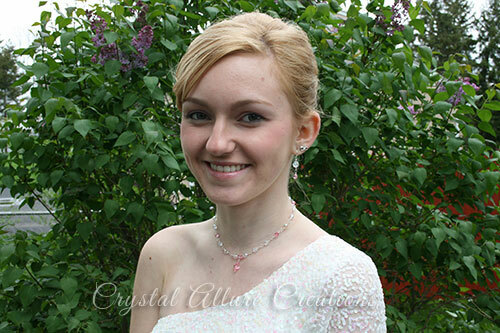 Thank you Courtney for choosing Crystal Allure Jewelry for all your prom jewelry!